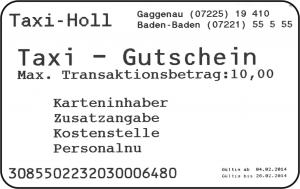 The Taxi Card Check Driving is a single card and replaced the old taxi-driving checks of taxi Holl. The Taxi Card Check Driving brings the transparency in your accounting. Depending on your created taxi Holl the Taxicard driving checks grouped by cost center or at the store level. The Taxi Card Check Driving is the voucher, of your guest down the right at your expense Taxi. You can use the max. Limit value of the card according to your wishes free. At the end of the month all the rides are conveniently grouped on one invoice and sorted by cost center.